3/4″ Inset Frame with Wire Hanger for a MetalPrint. The MetalPrints are provided with Exhibit Mounts and Performance “EXT” High Gloss finish for maximum durability. 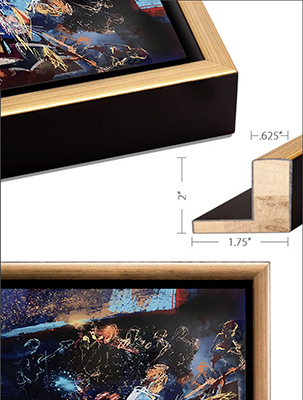 The frame included in this pricing for canvas prints is the gold and black float frame. For deliveries within California 8.5% sales tax is added to above prices. Packing and shipping to anywhere in the USA is additional $100 – $250 depending on size and destination. Examples of paintings that can be purchased as digital prints include my Art of Jazz and Iconic Silicon Valley Places series. In the case of the purchase of prints of my iPad artworks, I include a low resolution digital file of the final artwork, suitable for social media sharing (800 pixel maximum dimension JPEG with copyright notice watermark) and, where available, a time-lapse replay video. An Augmented Reality (AR) component overlay of the replay video, viewable on any mobile device using the HP Reveal app, is offered on a case-by-case basis. Please email me at jeremy@jeremysutton.com. Let me know which artwork you wish to buy (if it is on this site please include the url link). If it is a digital artwork then give me a rough idea of the maximum dimension you wish of the print and whether you would like a print on metal, canvas or paper. Custom artwork commissions are quoted on a case-by-case basis. After confirming what you wish to purchase I will send you a PayPal quotation / invoice for the artwork and any shipping. This invoice can be paid by credit card. Once payment is received the artwork will be shipped.